Keep Your Customers Coming Back with These Happy Hour Tickets and Betting Cards! 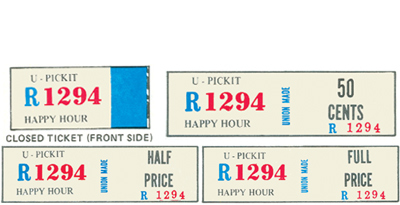 Customers absolutely love Happy Hour Tickets and Tabs, and bar owners love the extra profits! Our Happy Hour Jar Tickets feature the following pay-outs: 40% of the jar tickets pay full price, 40% of the tickets pay half price, and 20% of tickets pay ticket price of 50 cents or one dollar (minimum order is just two bags of 1200 tickets). We also offer 25, and 50-cent Happy Hour Pull Tab Games (the minimum order is 1,000 happy hour pull tabs). 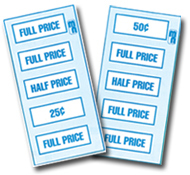 Feel free to browse our selection of Pull Tabs, Jar Tickets, Punch Boards or Coin Boards. Contact us at 1-800-233-0828 to get our Free 104 Page Bar & Nightclub Supplies Catalog.